CATTLE numbers on feed and industry feeding capacity set new records during the September quarter, according to results from the latest quarterly feedlot survey released by the Australian Lot Feeders Association and Meat & Livestock Australia this morning. Cattle on feed reached an unprecedented 1,126,666 head during the quarter, increasing by a further 6207 or 0.5 percent since the June quarter, and about 102,000 head more than this time last year. Almost all of the year-on-year growth was seen in moderate-sized feedlots 1000 to 10,000 head in capacity. Queensland recorded the largest increase in numbers on feed in the September quarter, rising by 22,581 head or 4pc from the previous quarter to 652,074 head, while South Australia was up 5pc to 34,526 head. Western Australia saw a decrease of 30pc to 24,596 head, as part of normal seasonal patterns in that state. 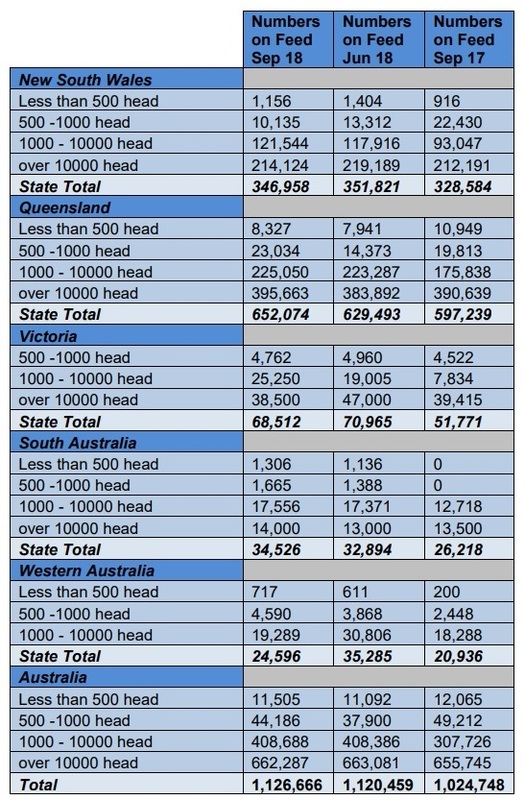 In contrast, NSW declined about 5000 head to 346,958 head (see graph below and table at bottom of page). 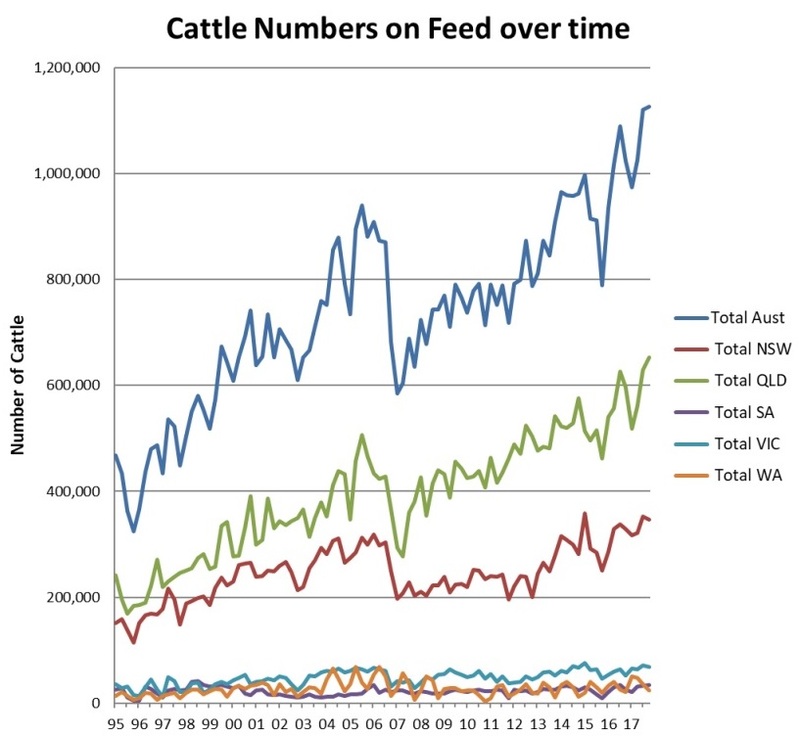 Feedlot capacity also continued its recent gradual increase, with NFAS-accredited yards across the nation state now reporting operating capacity of a record 1.309 million head, a rise of 31,000 head on the same quarter last year. Most states showed small gains, with Queensland capacity rising 23,000 head and NSW, 3000 head. Australian Lot Feeders Association president Bryce Camm said 2018 had been a year dictated by drought conditions across the eastern states, which had driven feedlot cattle inventory and grainfed beef exports to record levels. “All supply chain participants are being challenged under the current conditions, and it’s no surprise that commodity markets and cattle inputs are impacting feedlot margins,” he said. Increases in licensed feedlot capacity indicated that the underlying drivers and support for the feedlot industry went beyond drought mitigation, Mr Camm said. “Global demand for consistent high-quality Australian beef, driven by the exponential growth in branded beef, are the fundamentals that are behind investor confidence in the feedlot sector,” he said. MLA’s manager of market intelligence Scott Tolmie said continued strong demand, a favourable currency and grainfed beef supply caused export volumes to break the record set in the previous quarter, totalling 83,222 tonnes shipped weight, up 13pc from the same period last year. Shipments to Japan increased 9pc year-on-year, totalling 41,150t, and grainfed beef exports to Korea increased 6pc year-on-year, to 16,734t. Volumes to China lifted 184pc from year-ago levels, to 13,768t – a new record for China. On the production side, strong demand for grain collided with weak eastern Australian feeder supply, driving up grain prices and squeezing feedlot margins (click here to see Beef Central’s most recent 100-day grainfed trading budget calculation, which recorded a record loss of more than $200 a head); with some feedstocks nearing 10-year highs in August. “Wheat ex-Darling Downs averaged $433/t, while barley averaged $424/t, an increase of 14pc and 11pc on the June quarter and 36pc and 37pc year-on-year, respectively,” Mr Tolmie said. The national saleyard feeder steer indicator demonstrated vulnerability to spiking grain prices during the quarter, falling to a three-year low of 257¢/kg liveweight in August. The indicator rallied during September, ending the quarter at 277¢/kg, 3pc below where it finished in the June quarter. “Supported by Asian demand and a depreciating Australian dollar, the Queensland 100-day grainfed steer over-the-hooks indicator averaged 533¢/kg cwt, which was up 3pc year-on-year and gave some minor relief to feedlot balance sheets,” Mr Tolmie said.